Gyotaku is a very unique form of printmaking which developed from a very practical need. Nearly 200 years ago in Japan, it is believed that fishermen developed gyotaku or “fish rubbing” as a method of recording a catch. I’m not sure about this romantic origin story, but it has developed into a beautiful art form. 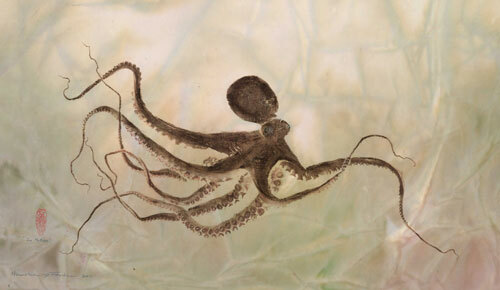 It isn’t just fish which are used as printing plates, but also octopus, squid and crab. The image above is from a wonderful printmaker named Heather Fortner. You can see more of her work in her Etsy shop – here. The method is relatively simple. Fish with prominent scales seem to make for an impressive print. Though I’m not speaking from experience, octopus gyotaku seem like a lot more faff. 1. Wash the fish and then pat it dry with kitchen paper. 2. Lay the fish on some news sheet or lining paper. 3. If necessary, remove the eye and stuff the socket with cotton wool. 4. Arrange the fish – if necessary, prop up the fins from behind with modelling clay and/or hold them in place with cocktail sticks. 5. Ink the fish by painting block printing ink all over the facing side. I have seen both water and oil based inks used. Carefully work the ink into the scales with a soft brush. 6. Use more kitchen roll to mop up any excess ink on the fish. If you don’t do this you will get a big mess and no detail. 7. Get some Japanese rice paper or similar. Place the paper gently over the fish, taking care not to smudge it. 8. Gently work the paper into the fish with dry hands. 9. Carefully remove the paper and either hang to dry, or place in a drying rack. 10. When dry, the traditional thing to do would be to paint in an eye. 11. Repeat as many times as you like. Though strictly speaking these would be classed as monotypes (each print is unique), clearly each print will be very similar unless you change your inking. 12. If you’ve used non-toxic ink and you’re feeling brave, you can skin the fish and eat it. Me explaining the technique is all very well, but here’s a video which explains it better. You may think this is a waste of a good fish. Maybe you’re right, but I think there is something beautiful about the preservation of the image of a once living creature. To have a printed testament to a resource which is becoming more and more scarce due to overfishing is perhaps necessary now, more than ever. Have you tried this method of printmaking? If you have, send in a photo, I’d love to see your results.